Choosing The Right Veterinarian - "How do I choose the right veterinarian"
When choosing the right veterinarian we suggest that you talk to your friends who own dogs first. Your friends are always your most trusted resource. 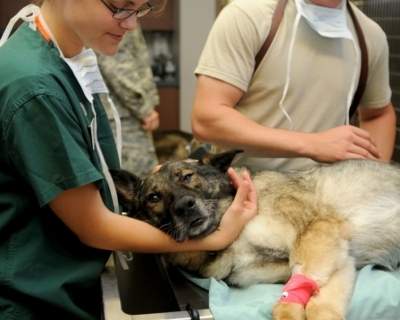 Friends will be more likely to tell you the pros and cons of the veterinarians they know. You can also ask them if to confirm any other things that others have told you. Other dog owners that pass by your house or neighbors that own dogs will probably be good as well. Likewise you can also contact breed clubs, rescues and shelters. All of these sources can provide you with lists of recommended area veterinarians. Once you have come up with a short list, schedule an appointment with the veterinarians you are considering. Discuss your dog with them and tell them about your specific wants and needs. 1). Do you feel comfortable with the vet? 2). Did the vet offer direct answers to your questions? 3). What additional or special education does he/she have? 4). Does he/she belong to any professional organizations? If the interview goes well and you have a good feeling, ask if you can have a brief tour of the facility. If they have a hospital on site this is a definite plus. 1). is the staff engaging, friendly and helpful? 2). Does the waiting area, exam room and lab look and smell clean? 3). What range of services (Including Emergency Service) do they offer? 4). How are after-hours emergency calls handled? Furthermore is the location a good fit logistically. Check to make sure the clinic keeps business hours that are convenient for you. Make sure that the office is conveniently located. If the vet has odd hours or is in an out-of-the-way location it will be difficult to keep appointments. Also if you need emergency assistance your dog’s life may be at stake if it is too far away.